Picross e3 came out at the very beginning of October last year, and despite my so-called “addiction” to picross, I didn’t actually play it until early last month. Maybe it’s because I was already knee-deep in another, cheaper picross game on my iPhone, or maybe it’s because I wasn’t completely blown away by the first two Picross e games. Most likely it has something more to do with me having played way too much picross last year. What kind of piss-poor picromaniac am I, anyway? Surprising nobody at all, Picross e3 is incredibly similar to the two games that came before it. Same look, same feel, same package. Only the puzzles are different. Well, maybe the music is different too. I honestly couldn’t tell you though, because in no picross game ever have I played with the default music on. I either put my own music on in the bakground or play in silence. It’s just that picross music is always so blah that it almost detracts from the experience. The Picross e games even take it one step further by not having a selection of BGMs to flip between. The one visually defining trait of Picross e3 is that the interface is absolutely awash in pink. I probably should have seen that coming, as the first one had a very nice blue theme and the second was drenched in a really ugly green. Pink was the only way to go. I mean, what else were they going to use? Yellow? I think not. It does look nice though, I’ll give it that. It just makes me feel a liitle self-conscious about playing it on the bus or around any of the more masculine members of my family. Less self-conscious than if I were playing an anime-looking game, though. Beneath the surface, there are a few other little tweaks to the formula. For one, there are only 45 puzzles in the Normal and Free modes, whereas the previous games had 60 each. Scandalous! The puzzles aren’t any tougher than they were in the previous games, so it seems like you’re getting a little less bang for your buck this time around. On the upside, it seems that you can play every puzzle in the game with the free rules (it doesn’t tell you when you make a mistake), which is a really nice option to have, as I much prefer the free rules. Unfortunately, I only heard about this option after I’d cleared all the normal puzzles. While it’s not much, I should note that the translation has also been “improved” for this edition. Previously, every fifth puzzle would disallow hint features and challenge you to solve the puzzle “using only your own strength.” The word “strength” has now been replaced with “wit,” which is admittedly more fitting for the English language, but I felt that the silly translation quirk was cute. It’s very much a “Shine Get!” kind of situation. 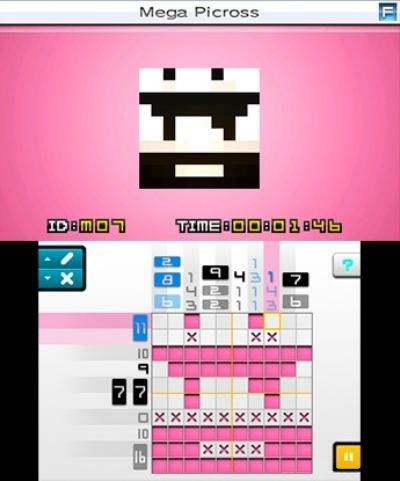 Picross e3’s big claim to fame is the new Mega Picross puzzles. There are 30 of them (so that’s where those missing puzzles went!) and they are downright brutal. Unlike the previous game’s gimmick puzzle, Micross, which was a collection of tiny, easy puzzles that created one big picture, Mega Picross looks like a normal puzzle on the surface. And then you look at the numbers, and everything falls apart. Regular picross puzzles have a set of numbers for every row and column that provide hints to which blocks on the playfield are the ones that you need to chisel. 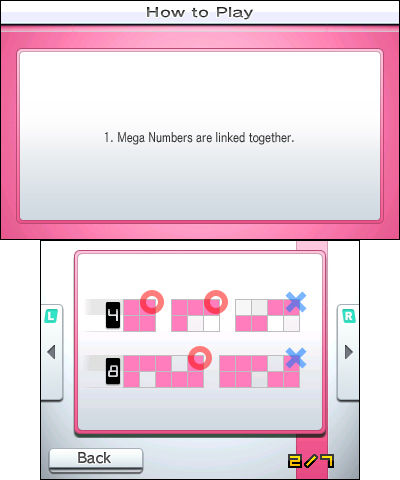 Mega Picross shakes this up by adding Mega Numbers: numbers that include blocks for two rows or columns at once. I really wish that I could explain it better, but it’s somewhat difficult to do. It’s also fairly difficult to wrap your brain around, or at least it was for me, as I had to play through the entire Mega set with the hint highlights turned on. What that does is highlight any columns or rows where you can make a definite move. Normally I’d shun the feature because it stips away all the challenge, but with the Megas, it was practically a necessity. The Mega Picross puzzles were the absolute most challenging picross puzzles I’ve ever faced, and even though I eventually conquered them all, I still feel like I don’t have a solid grasp on how to solve them. I sort of lucked my way through the set, and I want to eventually go back and play them all again without the hint feature so that I’m ready when Picross e4 comes, as I’ve heard that Mega Picross is coming back with it. Because it bears mentioning and I need to puff up my word count a little more, the medals awarded for completing each section are still present, and it still makes me feel like I accomplished something to see the main menu draped in virtual gold trinkets. Like I said before, Picross e3 is pretty much the same game as the previous two, but with different puzzles. I think you have to expect that in the puzzle genre though, so I can’t really fault it for that. In all honesty I was pretty appreciative for the much more palatable pink colour scheme. While I was a little taken aback at first over the apparently diminished number of puzzles, Mega Picross came out of nowhere and truly stole the show. The Megas were tough, and challenged me in a way that picross hasn’t in years. Honestly, I kind of wish that all picross was Mega Picross from now on. At least until I master that, at which point Jupiter will have to devise another twist on the formula to keep me on my toes. If you’re a picross master like myself, Picross e3 will likely be a more satisfying package than the first two games together, but you’ll probably want to triple-dip for the whole collection anyway because picross, that’s why. Just know that the game truly surprised and challenged me, and that Picross e4 has quite an act to follow.